Barre at the Bar… no, really! Join A Party With Us for this exclusive event! 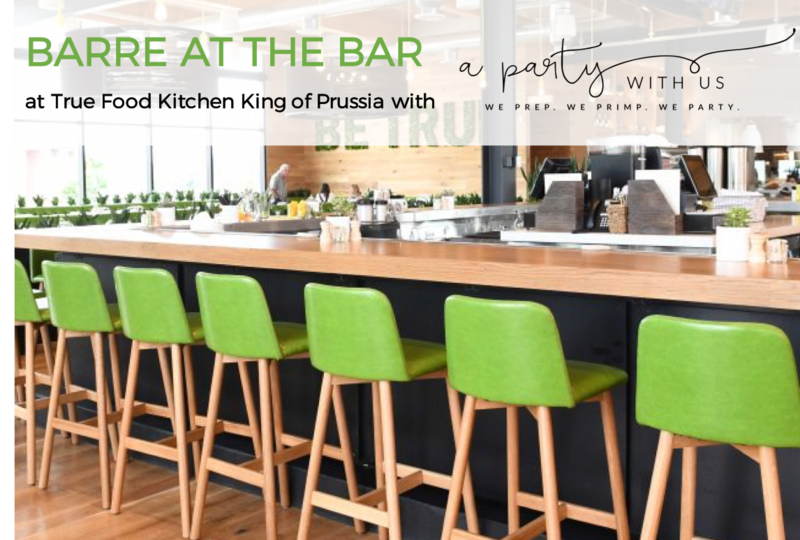 Get a full body barre workout and sip a mimosa at the True Food Kitchen ‘Bar’ on Saturday, November 18th at 9 am. Arrive at least 15 minutes early to get ready and meet your instructor,Kate Brewer, from TORQUE Spin, Barre, & TRX Studio in Collegeville, and her partner-in-crime and A Party With Us blog co-founder, Miranda Stull! Included in your $25 ticket is a 45 minute barre class and 1 mimosa. Stay after the class and get 15% off your brunch at True Food!!! Wear workout clothing, barre socks or sneakers, and bring your own mat! Grab your #barrebabes and we’ll see you there! Haven’t taken a barre class before? No worries, this class is for beginners and advanced students – modifications will be given! Learn more about barre by TORQUE at www.thetorquemovement.com.